Distance: 16 kilometers (10 miles) with around 150 meters (500-ish feet) of elevation gain. We're here, at the end of the world. It's been a long and rewarding journey. The route from Cee to Fisterra follows the curve of the land as it bends around the cape. 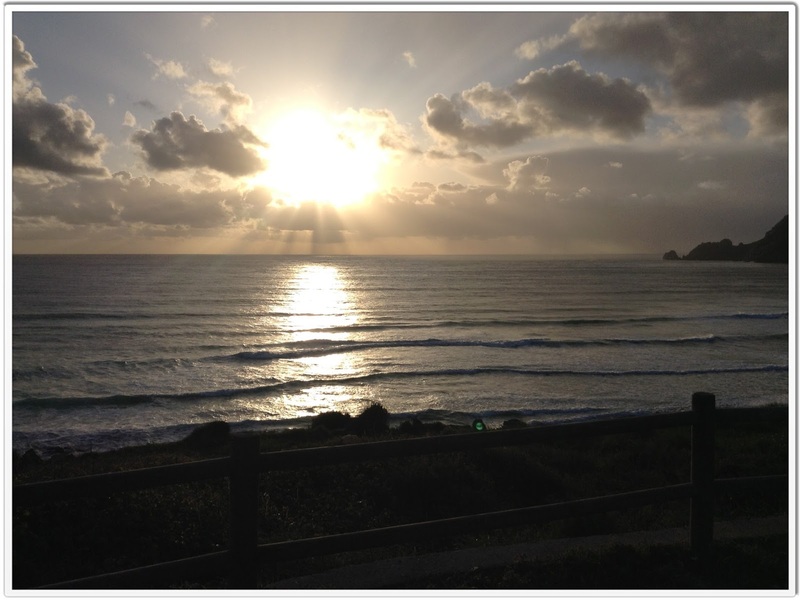 The Atlantic is almost always in sight, though the sea remains to the south until you reach the end of Fisterra's peninsula. At that point, the sea surrounds you and there is ocean to the east, south, and west. The Camino is not well-marked through Cee...when in doubt, follow the street signs to Corcubion. The Way isn't well-marked in Corcubion, either. Generally speaking, if you lose the arrows while walking through a Camino town, as we did once or twice, then find the nearest ancient iglesia. The Way almost always leads a pilgrim past the town's medieval church. We saw another horreo -- we've seen probably over a hundred of these things while walking from France through Spain. It's used to store potatoes and other veggies - the holes provide air flow while the elevation keeps the mice away. (photo was deleted). We left Corcubion and took a brief jaunt into some woods. Those fuzzy white things are sleeping lambs! From there, we could see our first glimpse of the end of the world...it was a jutting peninsula in the distance. and walked through some more woods. The trees thin as one nears Fisterra, then coming out of the thinning trees, you can see it! The town, Langosteira beach, and the lighthouse. We walked along Langosteira Beach, followed the boardwalk and pavement around the beach, up a short hill, and into the town of Fisterra. We walked up another hill and found our hotel. We checked in to our hotel, A Langosteira, and began our own personal ceremony of taking certain things out of our backpacks. All three of us wanted our packs with us when we reached the official end of our journey, but we each had our own opinion of what should and shouldn't be in our packs during our final steps. For example, though I'm glad Sage wore her Sorels when she walked through the Pyrenees, she hadn't worn them in a month and I saw no need to lug them any farther. 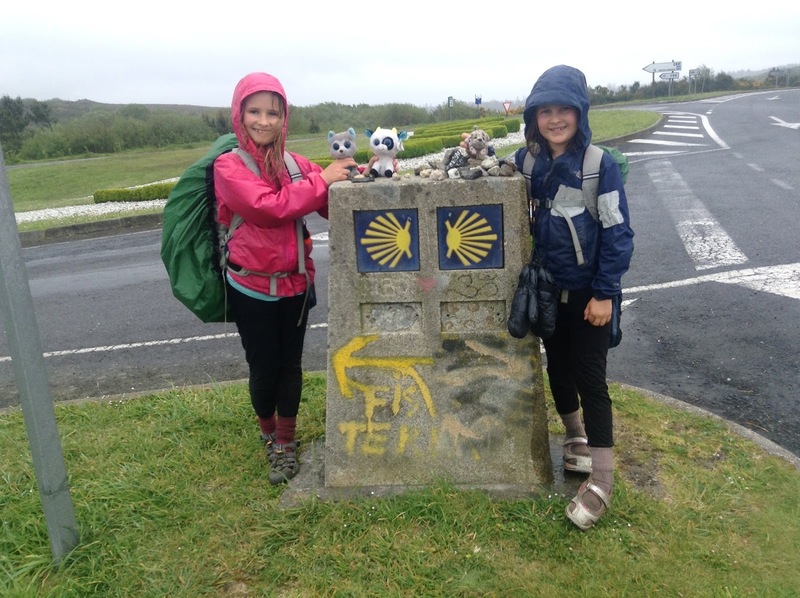 The girls took out their sleeping bags, which they'd only used four or five times (most albergues have blankets). I removed my hat, my balaclava, and my heavy winter gloves, which I'd never used, not even when hiking through the snow or cold rain. What came with us to the end of the world were the things we had needed the most throughout our Camino. Our packs thus lightened, we continued onward, through the town and up the paved road toward the lighthouse. It was an easy walk, with beautiful wildflowers alongside the road. We rounded the bend and saw the parking lot for the hotel and lighthouse. I asked the girls if they wanted to hold hands so we could symbolically and literally finish together, at the exact same time. Alex and Sage readily agreed, though at first there was some confusion since everyone wanted to hold everyone else's hand...that resulted in us trying to hike forward as a circle, which didn't work out so well. I then clasped the left hand of Alex and the right hand of Sage in front of my body so the girls' hands were touching each other as well as being enveloped in my own grasp. That did the trick. Together, we strode past the tourist booth selling shells, past the sidewalk leading to the hotel, straight on, directly to the finish line. I placed all our hands on that 0.0 kilometer mark and we finished together. We did it. 540 miles (870 kilometers) from Saint Jean Pied de Port, France through the entire country of Spain to Finisterre, the end of the world. Forty-one hiking days, five rest days, four small blisters, countless ancient villages, an abundance of glorious scenery and a wealth of newfound friends. To Alex and Sage, this felt like the end of their pilgrimage. For me, it wasn't yet over. I wanted to see that sun set over the Atlantic. Nine hours to go. Counting down the hours was easy. First, we explored the museum at the lighthouse...(photo was deleted)...and signed the guest book. Next, we explored the rocks and enjoyed the view toward our homeland (New Hampshire's over there somewhere). We hadn't eaten anything since we left Cee, so we clambered over the rocks toward the hotel/café (the restaurant at the end of the world) and had some sandwiches. 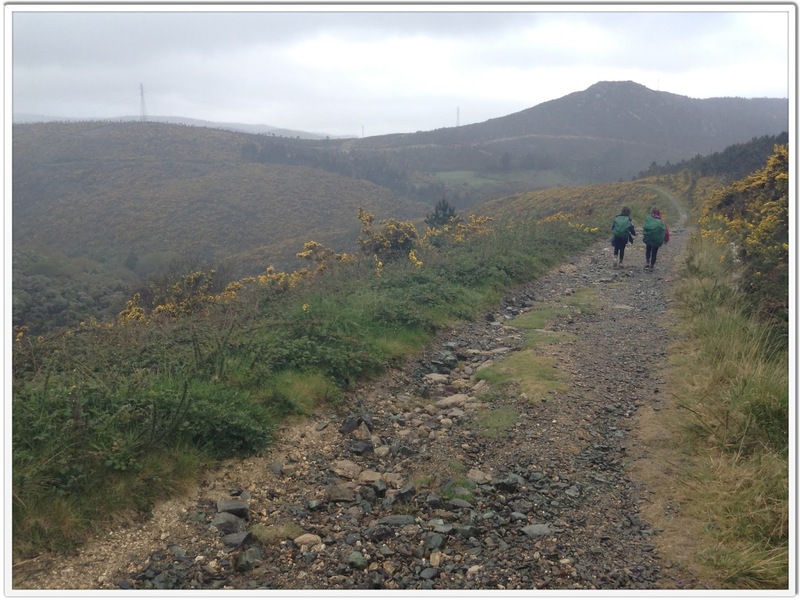 Once properly sated, we headed back to the town so we could receive our Santiago-to-Fisterra Compostelas at the municipal albergue. Mar de Fora was next. We returned to our hotel, took off our packs, changed into our sandals/Crocs,and set out in search of western sands. We found a beach, bared our feet and allowed the great waves to crash and approach. The cold salt water rushed toward us and enveloped our soles, over and over and over again. It was glorious. Our feet thus cleansed and our spirits lightened, we watched as the sea extinguished the sun. 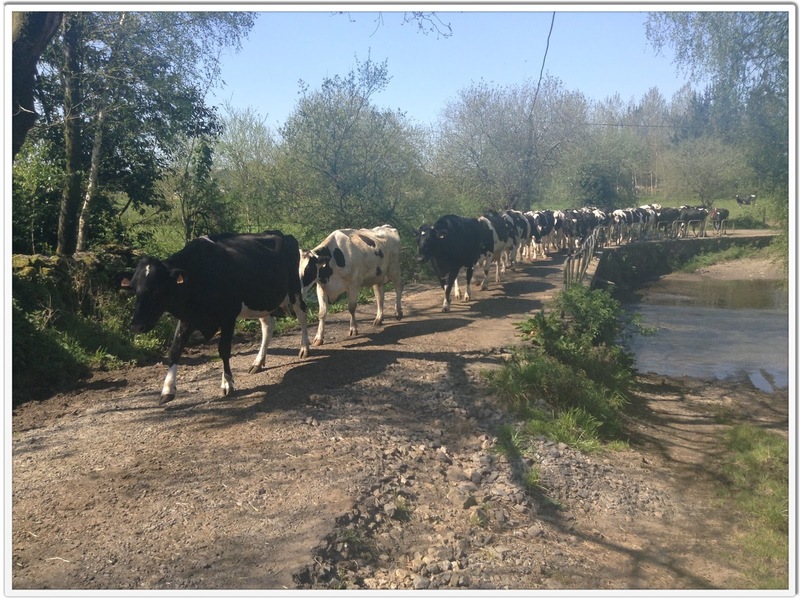 Our Camino is now over. It's 8:25 Sunday morning and the girls still snooze. There's no reason to wake them; we've nothing to pack and nowhere to walk. Alex and Sage want to spend the day walking along Langosteire beach. Apart from that, we have no plans. It's back to Santiago tomorrow, though this time it will be by bus and not on foot. All three of us are now nervous about riding in motorized vehicles. For the past forty-six days, we have walked to get to where we wanted to go. We have not been in a car, taxi, bus, train, or plane since March 12. We have not moved more than three and a half miles an hour since we left France. Riding on the bus might therefore feel frightening. Our flight to the States leaves Santiago the day after tomorrow, April 30. Home. I'm ready to be there. There are a few personal loose ends I plan to immediately tie up. I've also got some writing to do. Alex made a habit of turning our paper tablecloths into pieces of art during every one of our pilgrim's menus, from SJPP to Fisterra...(the Blogger App deleted the photo). From Santiago, the rays of the shells point the way to Fisterra. This is not the case from SJPP to Santiago...the rays of those Camino shells point up, down, and all around...follow the yellow arrows instead. A number of people have recently attempted to convert me to Christianity via written personal Facebook and email messages. Thanks, but no thanks. I've read and studied the Bible, and I spent years of my younger life reaching out to the Christian God and Jesus. All that ever came of it was a feeling of deep dissatisfaction and a sense of being conned. The best thing I ever did was come to the realization that you don't have to believe something just because someone else tells you to. And...well...isn't it a wee bit arrogant of you to think your belief system is THE right one for everybody (and not just yourself), and that anyone who doesn't share your belief system is missing a deep sense of love in their life and/or destined for hell? That's exactly the kind of insecure and illogical thinking I do not want to instill in my children. Rant over. Thank you for following us on our journey. I'm pleased this blog was useful to pilgrims and I'm happy so many people have enjoyed my posts. There will be three more entries to this blog, and each will be posted after we return to the States. The first will announce the total funds raised for GirlVentures and Global Fund for Women. To everyone who donated - thank you!!! To those who have not yet donated, please click on the appropriate links at the top of this blog and contribute what you can. 100 percent of your money will go directly to the female-empowering organizations (not to us), and it's all tax-deductible. The second post will be a gear review - the girls and I will go through our gear and comment on what worked and what didn't work, and why. The third post will contain two video compilations, one from Alex and one from Sage. Both girls have taken hundreds of photos and videos with their iPods, and both have compiled their own three minute videos using their own footage. They have done this on their own with zero input from me, so what you will see will be one hundred percent their creative efforts. The girls are now awake...time for breakfast. Signing off now from Spain - thank you once again for all your well-wishes and support! The world is full of beautiful people. Distance: 33 kilometers (20.5 miles) with around 200 meters (650-ish feet) of elevation gain. Two more days of hiking. 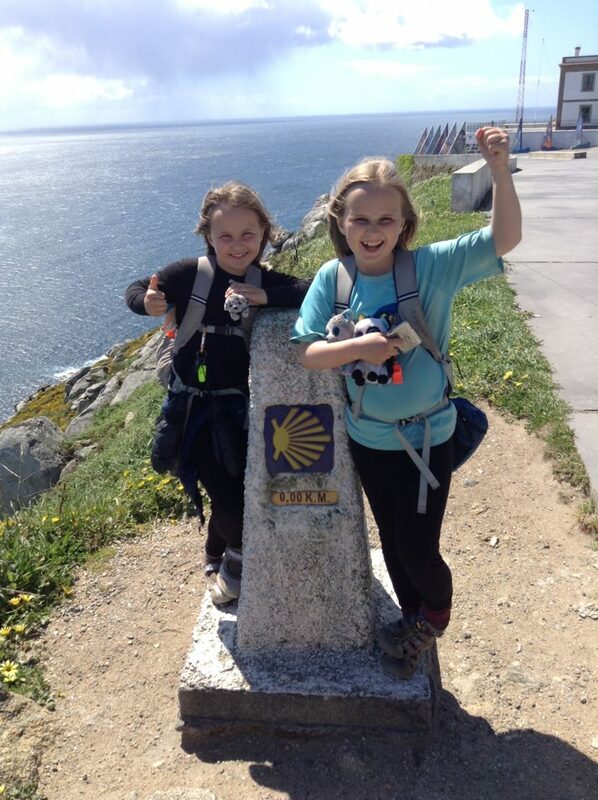 I'm ready to be done now, though for me, the Camino won't feel over 'till I've seen the sun sink into the Atlantic. I'm going to make some changes when I get home. There is so much in our house we don't want or need - time to simplify. Also, loose ends abound - time to tie them up. The Camino has shown me exactly what I do and do not want in my life, and I plan to react accordingly once we return to New Hampshire. What a perfect hiking day! Overcast skies, stiff and cold wind, very light rain - this was exactly what we needed; all three of us feel our best in such weather, it keeps us cool and motivates us to move quickly. The girls practically ran the entire 33 kilometers. We left Casa Pepa at 8:15 and arrived in Cee at 3pm...that's a pace of 3 miles an hour...Alex and Sage stayed ahead of me the whole day and at times it was difficult for me to keep up. The scenery was GORGEOUS! The stretch between Olveiroa and Cee was one of my favorite parts of our entire Camino. 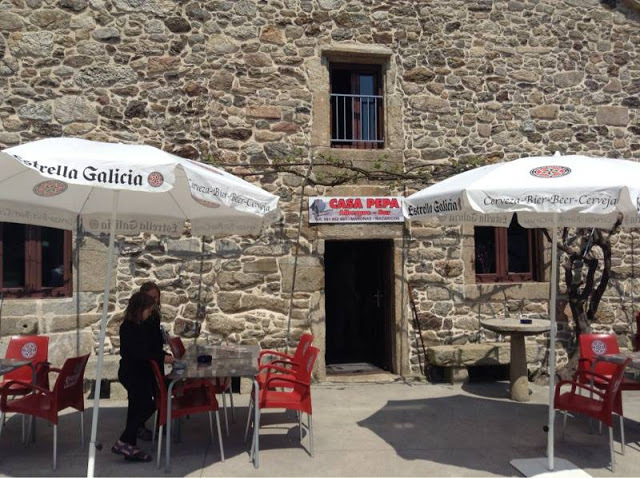 By the way, there's a nice bar/restaurant in Olveiroa called Loncho. It has excellent prices and there's a convenience store inside...and it's attached to a nice-looking two-star Pension. 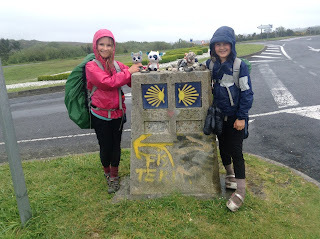 We left Olveiroa and found it hard to believe we were only 18 miles from the end of the earth! 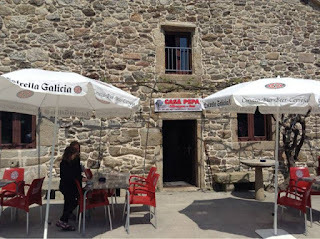 When you get to Hospital, there is one last bar before you reach the split between Finisterre and Muxia...if you need anything before you walk another long stretch, get it here. 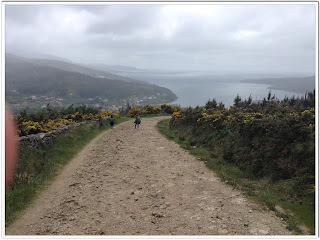 Once you reach the split, you'll go left for Finisterre, and right for Muxia. After walking walking walking, you might see...is that...ocean..? Cee is a good-sized ocean-front town. Doesn't feel much like a pilgrim stop...more like a Spanish vacation area. Decided I wanted to grab a hotel - guess we are now finished with the albergues on this trip, and I have both good and bad feelings about that -- so we are now happily lounging at Hotel La Marina. We have a huge, clean triple for fifty Euros. The folks at the reception area are kind and straightforward. No restaurant on the premises but there's a fantastic place to eat just across the street. Can't remember the name but the receptionist will tell you about it...literally across the street and under an overhang. That restaurant has great food, cheap prices, and fantastic service. We are excited to be near the end of our journey. I am thankful the girls have done so well and enjoyed this trip so much. I've had the time of my life, though I think the big toe on my right foot has paid the price. Once upon a time, both my toes pointed straight ahead...now, after 530 Camino miles, the big toe on my right foot points outward. Methinks I now have a bunion...hopefully, it won't require surgery. The girls are grossed out and worried about my deformed toe, but I can't help laughing when I look at it. The thing is so silly-looking, pointing starboard. I probably won't laugh if/when medical attention is required, but for right now, I'll choose to see the humor. We will be at the end of the earth tomorrow!! Misc. notes - We met a friendly German man just outside of Cee today - he recognized us from this blog. I was tired and out of it and may have come across as dazed at first (I WAS dazed, actually...fatigue!). I hope you made it to Finisterre today, kind German fellow (if you are reading this). I hope I didn't come across as less than amiable when we met. I was so tired...and barely coherent...much as I am now. It was a pleasure to meet you. The girls were so fast today! I'm thinking they both might be ready for a single-day Bonds traverse when we get home. Maybe even a Presi Traverse...we'll see. Wow, I AM exhausted. This was our longest day yet and every part of my body is trying to shut down as I type. Have no idea whether or not I'm making sense. Must get to sleep. 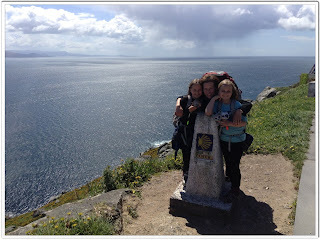 More tomorrow, after a good night's rest and a short day's walk to Finisterre, the end of the world.